William J. MacPherson was born and raised in Hamilton, received a B.Sc. and M.Sc. from McMaster and a B.Ed. from the University of Toronto. He then applied his knowledge and skills as a high school science teacher and department head for 31 years in Hamilton, retiring in 2000. Bill has been married to Helen for 41 years. They have two daughters who, with their husbands have given Bill and Helen three grandchildren. He is a member of St. Ann's Parish in Ancaster and enjoys gardening with Helen at home as well as other gardening projects such as at Jason's House, a group home for adults with special needs. Bill joined the Lodge of the Ancient Landmarks, No. 654 in March 1988, and was installed as Master in May 1997. As a PM he soon found himself elected to the role of Lodge Secretary, a position he held for eight years. While Secretary in 2005, he played a prominent role in the successful amalgamation of Ancient Landmarks with Doric Lodge No. 382. 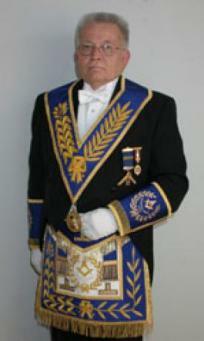 He is a member of Holy Royal Arch Masons - Ancaster Chapter No. 155, and is presently the Immediate Past First Principal. On top of this, Bill is a member of the Scottish Rite, 18th degree. In 1995 he was made a Fellow of the College of Freemasonry by Grand Lodge after completing the necessary course material. At the District level, Bill has served as chairman of inter-district events, Member's Resources, the Benevolence Committee, Masonic Education and the MasonicCHIPS program. He continues to assist with the annual beef and corn roast and CHIPS clinics.